The Logitech Mobile Speakerphone P710e connects to a mobile phone or tablet via USB or Bluetooth wireless, and supports NFC touch-to-pair technology. It also has an integrated stand that holds your device for second-screen versatility. Digital Signal Processing (DSP) Advanced DSP technology enables precise tuning for both the mic and speaker so conversations are more life-like. True wideband audio, lets you enjoy a life-like communication experience. The speakerphone also features acoustic echo cancellation and a noise-cancelling microphone for premium sound even in noisy environments. Additional conveniences include touch controls, separate answer/end call buttons, visual indication for incoming calls, and a headphone jack for privacy. The built-in battery charges via USB or an AC adapter (not included), and it provides up to 15 hours of talk time between charges. The included zippered neoprene carrying case allows for easy storage and portability. 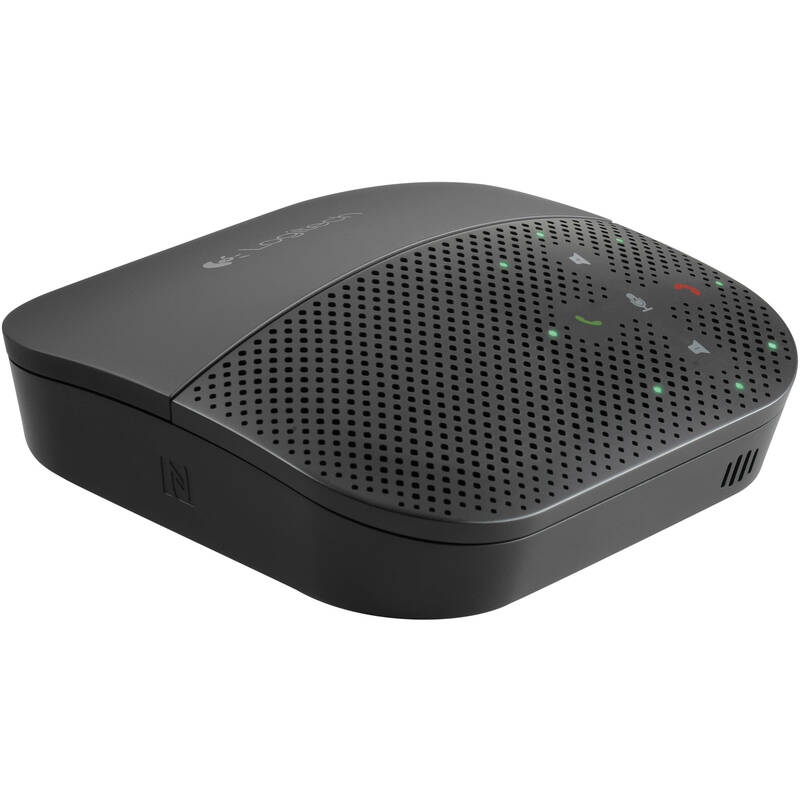 Box Dimensions (LxWxH) 7.5 x 6.0 x 2.5"
Mobile Speakerphone P710e is rated 4.8 out of 5 by 4. Rated 5 out of 5 by Seth G. from Excellent Product Works very well. Easy to carry around & works WAY better than built-in iPhone's speakerphone function. Cuts through echo-y rooms letting me hear & be heard clearly. Only limitation is its too small for a large meeting room for everyone to be heard by the mic. But we could all hear the caller very well. Seems to last several hours of continuous use, and was easy to pair w/ both iPhone & Mac laptop. Rated 4 out of 5 by Bob from Better than mobile phones speaker phone I found it easy to use to set up and use. The person on the other end of call said it worked great and they could here everyone fine. The only downside is that volume of the speakerphone could be a little greater. Rated 5 out of 5 by Anonymous from This the speaker phone to it! Everything about the P710 is great! The sound quality is awesome and callers on the under end can hear you clearly. It was easy to install and is small enough to carry in your briefcase.